DocMagic, Inc., the premier provider of fully-compliant loan document preparation, regulatory compliance and comprehensive eMortgage services, announced that QRL Financial Services (QRL), a nationwide provider of residential mortgage lending services for community banks and credit unions, has leveraged its eVault technology to purchase eNotes. The announcement was made during the 24th Annual CUNA Lending Council Conference. ANAHEIM, Calif. /California Newswire/ — Annual CUNA Lending Council Conference — DocMagic, Inc., the premier provider of fully-compliant loan document preparation, regulatory compliance and comprehensive eMortgage services, announced that QRL Financial Services (QRL), a nationwide provider of residential mortgage lending services for community banks and credit unions, has leveraged its eVault technology to purchase eNotes. The announcement was made during the 24th Annual CUNA Lending Council Conference at the Disneyland Hotel in Anaheim, Calif. Implementing an eVault means QRL can increase new business by extending its reach to lenders that are ready to implement eClosings and sell eNotes. In addition to providing improved service, they will competitively position themselves for the future. The deal will make QRL one of the first investors outside of the GSEs to begin purchasing eNotes. Because QRL is using DocMagic’s SmartDocs, all documents retain a tamper evident seal to ensure data and document integrity. Using static documents, that don’t include SmartDoc transactional (XML) metadata, means some organizations have the difficult, costly and time-consuming task of confirming that data and documents are in sync. The solution will also create greater secondary market process efficiencies because of reduced cycle times. QRL will be able to fund faster with fewer post-closing document issues. DocMagic and QRL will be attending the 24th Annual CUNA Lending Council Conference from October 28-31, 2018 at the Disneyland Hotel in Anaheim, Calif. 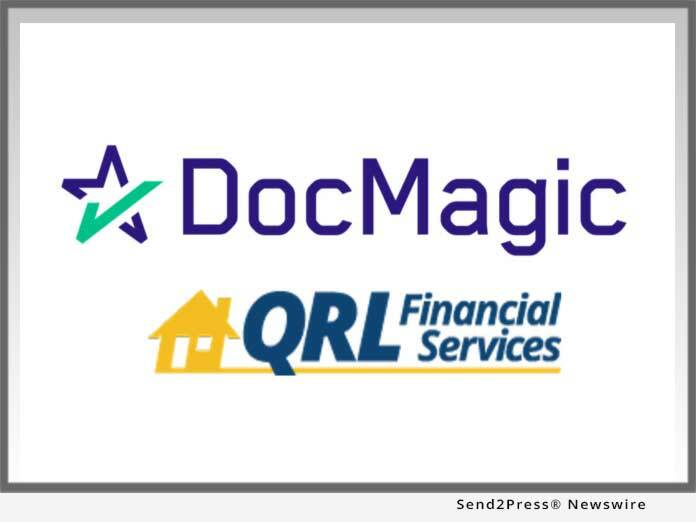 The companies can be contacted at michael@docmagic.com for DocMagic and sales@qrlfinancial.com for QRL. DocMagic, Inc. is the leading provider of fully-compliant loan document preparation, compliance, eSign and eDelivery solutions for the mortgage industry. Founded in 1987 and headquartered in Torrance, Calif., DocMagic, Inc. develops software, mobile apps, processes and web-based systems for the production and delivery of compliant loan document packages. The company’s compliance experts and in-house legal staff consistently monitor legal and regulatory changes at both the federal and state levels to ensure accuracy. For more information on DocMagic, visit https://www.docmagic.com/. QRL Financial Services, a division of First Federal Bank, is a nationwide provider of residential mortgage lending services for community banks and credit unions. The company’s comprehensive suite of offerings includes wholesale and correspondent lending, portfolio loan services, appraisal management and sub-servicing. QRL retains servicing and does not cross sell. Providing free access to a loan origination system and a dedicated loan coordinator, QRL Financial Services assists community lenders in creating an exceptional mortgage experience. For more information, visit http://www.qrlfinancial.com/ or call 888.766.4734.